Citation Information: J Clin Invest. 2018;128(8):3517-3534. https://doi.org/10.1172/JCI120316. A homozygous truncating frameshift mutation in CEP57 (CEP57T/T) has been identified in a subset of mosaic-variegated aneuploidy (MVA) patients; however, the physiological roles of the centrosome-associated protein CEP57 that contribute to disease are unknown. To investigate these, we have generated a mouse model mimicking this disease mutation. Cep57T/T mice died within 24 hours after birth with short, curly tails and severely impaired vertebral ossification. Osteoblasts in lumbosacral vertebrae of Cep57T/T mice were deficient for Fgf2, a Cep57 binding partner implicated in diverse biological processes, including bone formation. Furthermore, a broad spectrum of tissues of Cep57T/T mice had severe aneuploidy at birth, consistent with the MVA patient phenotype. Cep57T/T mouse embryonic fibroblasts and patient-derived skin fibroblasts failed to undergo centrosome maturation in G2 phase, causing premature centriole disjunction, centrosome amplification, aberrant spindle formation, and high rates of chromosome missegregation. 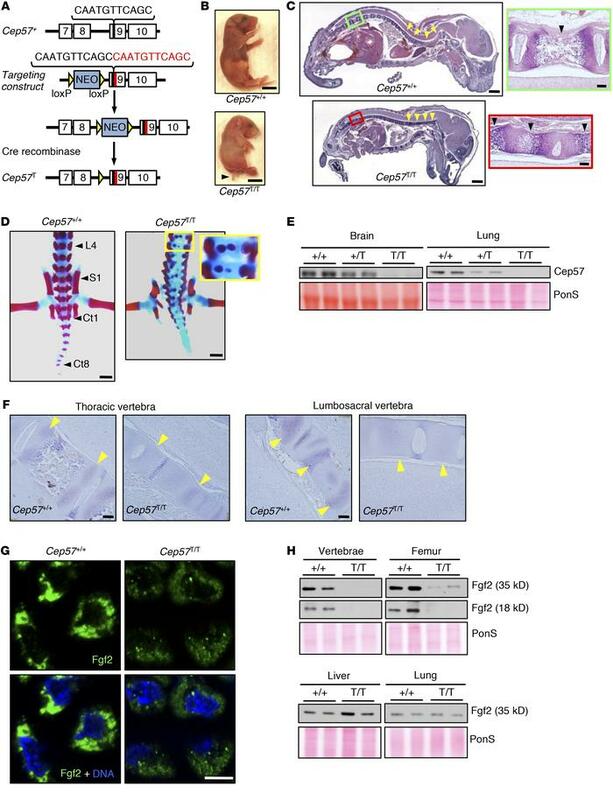 Mice heterozygous for the truncating frameshift mutation or a Cep57-null allele were overtly indistinguishable from WT mice despite reduced Cep57 protein levels, yet prone to aneuploidization and cancer, with tumors lacking evidence for loss of heterozygosity. This study identifies Cep57 as a haploinsufficient tumor suppressor with biologically diverse roles in centrosome maturation and Fgf2-mediated bone formation. Cep57 controls Fgf2-mediated bone development. (A) Gene targeting approach used to mimic the CEP57T patient mutation. Shown are the relevant portion of the murine Cep57 locus (top), the targeting vector (the 11-bp duplication is highlighted in red) with the recombined hypomorphic allele (middle), and the final Cep57T allele following Cre-mediated excision of the neomycin (NEO) selection cassette. (B) Images of pups several hours after birth (arrowhead marks the short curly tail). Scale bars: 5 mm. (C) H&E-stained sagittal sections of 1-day-old pups. Arrowheads indicate the degree of spinal cord curvature. Scale bars: 1 mm. High magnification of the areas marked by red and green boxes are shown to the right. Scale bars: 100 μm. (D) Images of alizarin red– and Alcian blue–stained bone (red) and cartilage (blue) tissue of 1-day-old pups. Indicated are lumbar vertebra 4 (L4), sacral vertebra 1 (S1), and caudal vertebra 1 and 8 (Ct1 and Ct8) landmarks. Inset (yellow box) shows defective (bifid) vertebral body ossification. Scale bars: 1 mm. (E) Western blot analysis of brain and lung lysates of 1-day-old Cep57+/+, Cep57+/T, and Cep57T/T mice. Ponceau (PonS) served as loading control. (F) Representative images of sagittal sections from thoracic and lumbosacral vertebral regions of 1-day-old pups immunostained for Fgf2. Arrowheads indicate regions with Fgf2 expression. Scale bars: 100 μm. (G) Analysis of Fgf2 subcellular localization using immunofluorescence in paraffin sections of the lumbosacral region of 1-day-old pups labeled for Fgf2. Nuclei were visualized with Hoechst. Scale bar: 5 μm. (H) Western blots of tissue lysates probed for Fgf2. Shown are the 35-kDa (full-length) and 18-kDa isoforms of Fgf2. PonS served as the loading control. Western blots are representative of 3 independent experiments.